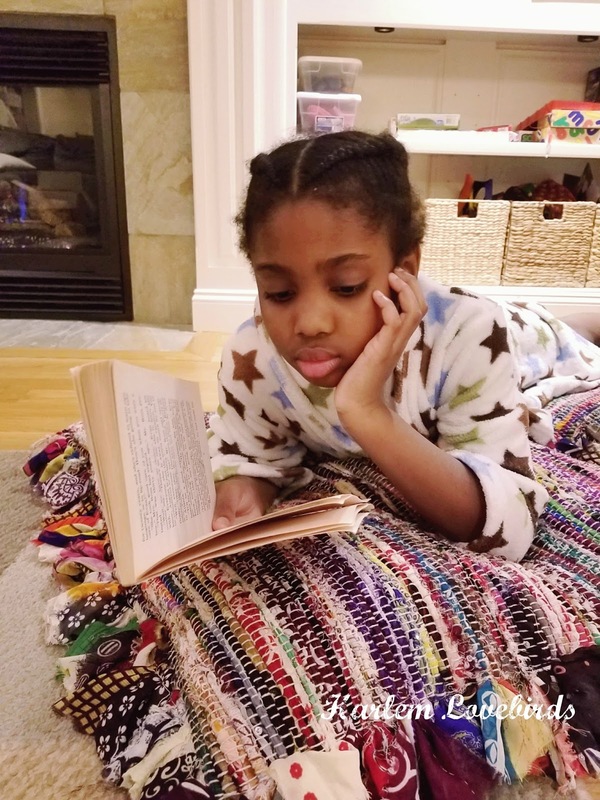 The month of January flew by and one of the things we've been committed to as a family now more than ever is reading more books. With the recent data about kids and screen time plus as someone who works in a world of screens, it's important for me to have time that we all pull away from our devices. My kids have a strict screen time rule: we are screen free on school nights. Their schools have some screen time, which is fine, but otherwise from TVs to tablets, the children don't use them during the week. It's been a struggle at times and my 7 year old being older is good at reinforcing it with her 3 year old brother, but this holiday when we took down our Christmas tree and were left with a gaping space I decided it would be perfect for a cozy reading nook as an alternative to screen time. I partnered with Wayfair to create a simple yet inviting reading nook with 3 key elements and while I hope to add more at some point for now, it works! Bookcase - While we already have built-ins filled with toys (I tried to wrangle some items with baskets! ), I didn't want to get a bookshelf that competed with what was already there so I stayed with a wider 3-shelf bookcase. We allocated the top of the Everett Standard Bookcase for library books which so far has helped keep them from going missing, one shelf for each child and the bottom shelf for oversized books. We have many more books than those pictured, but I allowed the kids to fill them with the books they liked the most and that's what they picked! Oversized pillows - If there's one thing I'm constantly reminding the kids about it's to stop tossing my throw pillows onto the floor! In fact there are a couple throw pillows from Wayfair (remember this post?) that they are obsessed with. 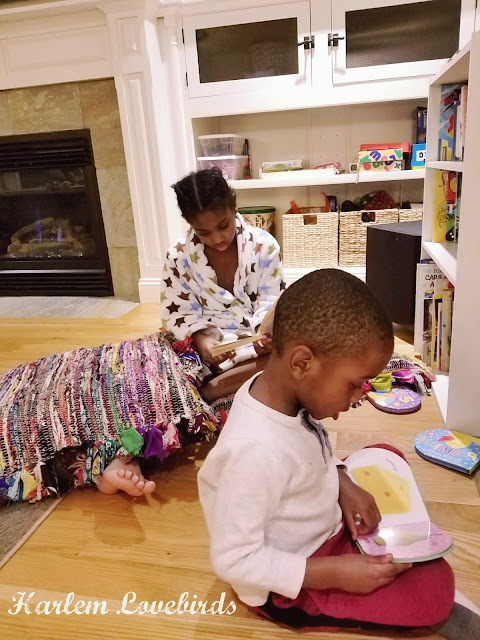 I decided to add color to our neutral family room by selecting colorful Mirabella Floor Pillows made of 100% natural fibers that the kids can throw around as they please. Art - The color of the pillows was inspired by art I picked up when visiting the Charleston City Market in South Carolina where we visited for Christmas. My side of the family tree has roots in South Carolina and now with my parents there it's a wonderful reminder of our heritage. The images of the low country and motifs of women in hats plays beautifully off the pillows. 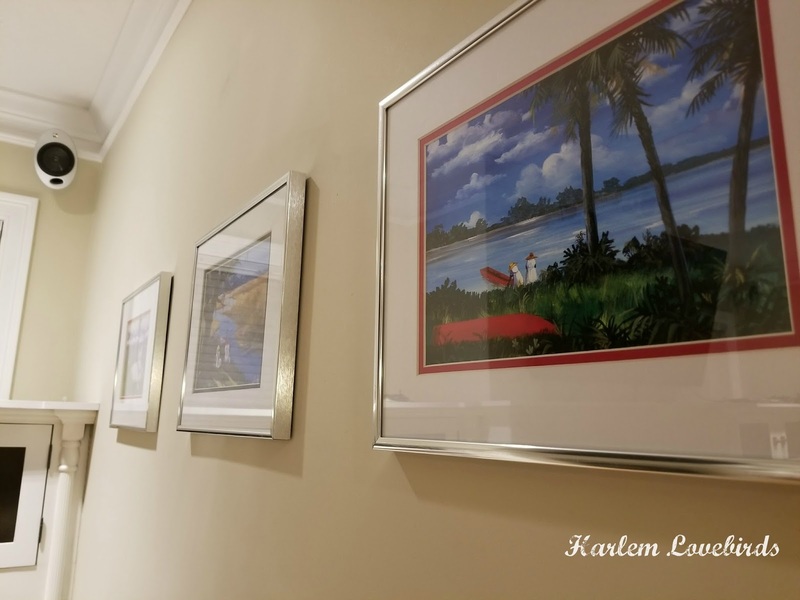 I selected affordable Metal Matted Photo Pictures Frames to compliment the family photo gallery in the same sight line around the corner. While it wasn't part of the official decor, having the reading nook near the fireplace especially during the record breaking freezing temperatures we've been having here in Boston really is special. 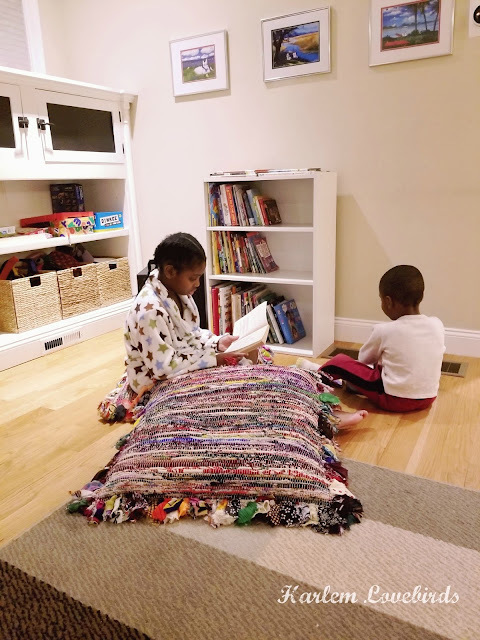 The kids cozy up together and pick their books, and it's a relaxing way to wind down before bed. Down the line I'm thinking of adding a raised planter above the floor vent for a touch of greenery, but will either have to get a fake plant or one that can withstand the blowing air. For now it's perfect for the kids, and I'm thankful to Wayfair for helping us stay on track on our family goal of reading more books and less screen time in 2018. Do you have a space in your home that you could redesign to help you reach your New Year's resolution?